Although it isn’t officially winter in the northern hemisphere just yet I feel like the bare branches, fluffy layer of snow, hot chestnut stands and Christmas markets are excuse enough to change from my autumn to my winter capsule wardrobe. This is the second seasonal capsule wardrobe I have put together and I definitely learnt some lessons with my first one. I talk all about my autumn capsule wardrobe hits and misses for you here. I’m hoping you can avoid my mistakes and also benefit from understanding the pieces worth investing in. The great thing about building your own capsule wardrobe is that you get to make your own rules and figure out what works best for you. In my creating a capsule wardrobe post series I give guidelines around 30, 40 and 50 piece wardrobes. For this seasons’ capsule my total count came to 32 pieces for my winter capsule wardrobe. I came in under my 39 piece count for my autumn capsule because I have excluded accessories this time. Below I’ve listed a breakdown of my 32 pieces and whether they are old existing pieces or new to give you a little insight into my process and decisions. 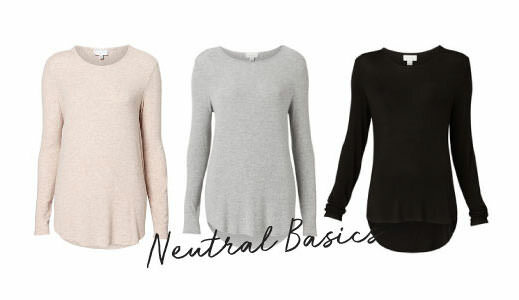 Neutral basics (all old): These tops are my everyday go-to’s. I picked my favourite cut and brand and got it in three neutral colours. That way they are super versatile and make a great layering piece. Pattern (old): A patterned piece to add some extra detail to outfits that include a lot of neutral basics. I think you can never go wrong with stripes but this could be anything from polka-dots to florals. Detail (new): As you guys know my favourite detailed pieces are the ruffled kind. So when I was choosing a feature top with some textured detail I couldn’t go past the flattering and super comfy peplum cut. I’ve stuck to a solid version of my accent colour and a soft non-creasing fabric. As an added bonus it’s perfect for those days when you’ve outdone yourself with the gingerbread too! Blouse (old): It’s always a good idea to have a pretty, neutral blouse in your wardrobe. Perfect to dress things up a bit but not too fussy that it gets in the way of layering. Collared (old): My thoughts for this piece were to have the collar showing from underneath a cosy sweater to add a little bit of detail on days when I’m feeling too plain-jane. I’ve chosen my favourite linen shirt because linen looks totally acceptable when it crinkles, which is likely to happen when its jammed under a sweater, scarf and coat. Accent (old): A classic cut light sweater in my accent colour – perfect as a top on it’s own or with a heavier knit over the top for days when you need lots of warm layers. Textured (new): This fluffy sweater is one of my favourite pieces in my winter capsule. It’s a neutral shade that will go with anything but has a cosy teddy-bear like texture that attracts nice warm hugs from strangers when you’re freezing your bum off walking from A to B. I usually steer clear of fluffy because I’ve had sweaters like this before that malt everywhere. You end up with fluff all over your other clothes, in your mouth and up your nose. This kind of fluff is especially attracted to that essential layer of lip balm that is required in winter. Not fun. So when I spotted this one I used Jason’s black jumper as a test subject and rubbed it all over him in the store. Lucky for him (or maybe lucky for me) it was a winner and didn’t shed one bit. Neutral (old): The neutral grey sweater. I don’t think I need to explain this one! Cardi (old): A nice thick cardigan is perfect for layering under coats. Also great for those days when you want to avoid that ‘I just got electrocuted look’ after peeling off a sweater full of static energy! Turtleneck (old): There is something so cosy about a turtleneck. They are also great for times when you will be outside a bit. The high neck keeps you extra warm. Accent (old): My accent sweater is a multi-tone knit. As good as solid colours are for mixing and matching some days you just feel like wearing a statement piece. The thing I like about this one is that it incorporates lots of the colours in my colour palette so is still really versatile. Neutral (old): The neutral cable-knit is a must have for any winter wardrobe. Goes with everything and always looks good! Jacket (old): It’s a good idea to include a jacket in your winter wardrobe. It can be worn as your top layer on warmer days at the beginning and end of the season and can be layered under a coat on colder days. Puffer (new): The puffer is an essential winter item. Perfect for everyday running around and if you choose wisely can also be dressed up a bit. Simply pair with leather boots and a pretty scarf and beanie. Parker (old): You might be ok with sticking to the puffer as your only basic coat, but I tend to get bored when I wear the same thing everyday. So I’ve also included a parka in my capsule. The faux-fur trim adds a little bit of detail that the puffer doesn’t have. Accent (old): If you are spending the day or night outside your coat is the only thing people will probably see of your outfit. And as good as black is, sometimes you want to get a little bit fancy. That is where you can choose something with some colour or texture. Neutral (old): A classic cut coat that is a bit dressier in neutral tones so that it’s super versatile. Longline (old): To be honest this one really wasn’t necessary… but it’s nice to mix up the length of your coat sometimes and I already owned it. Just couldn’t leave it out. Skirt (old): In autumn I learnt that including only skinny jeans in my capsule got a little boring some days. And I also noticed lots of people wearing skirts with tights. My tights are super warm and fleece lined so I thought I would include one skirt this time and see how I go with it. Light (old): I know lots of people save white for summers so you might think this piece is just wrong for winter. But there is something I love about including white in my outfit on a snowy day. Maybe it’s because I can easily go into camouflage mode… or maybe it’s just because lots of white is pretty! Wide (new): Another piece to help mix up my skinny jean obsession – my first pair of mom jeans. The loose fit is super comfy and looks so nice rolled up a little with boots. Detail (old): Last year I found a pair of ripped jeans with the holes filled in so no sneaky cold air gets in! I love them for casual days. Skinny( old): Classic navy skinny jeans with a frayed hem detail to add a bit of detail. Dark (old): No capsule would be complete without a pair of black jeans. So here they are. Perfect for looking a bit dressier without actually being dressier at all. Canvas Sneakers (old): Now I’m not sure that these will actually be worn in winter but just incase we have some warmer days I wanted to include them. Leather Sneaker (old): My Adidas Superstars are lovely and padded so they are pretty warm and perfect for the beginning or end of the season or when you have to duck outside quickly. Lace Up Boots (old): Another pair for the beginning or end of the season when it’s not too cold. Also great when you need to look a bit more dressed up or elegant without compromising your foot warmth too much. Versatile Boots (old): If I could only have one pair of winter boots it would be my Timberlands. They are a classic shape, go with almost anything and perform really well in the cold and snow. Classic Boots (new): One of my biggest investments pieces for this capsule was my Panama Jack boots. I love them because they are super warm with a fleece lining and thick sold, can be worn normally or folded down and don’t have that super bulky look that other waterproof shoes can have. Snow Boots (old): We get snow where we live and we travel to snowy spots quite often in winter so these were a must have for me. You can read my guide to snow boots here. 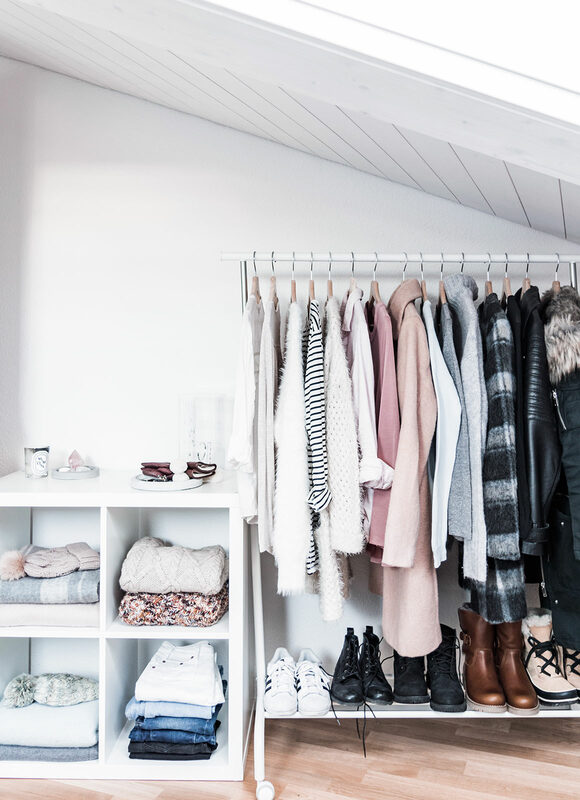 This capsule wardrobe has been put together for a northern hemisphere winter so is suitable for temperatures ranging from -10-15°C (15-60°F). Incorporating a combination of comfy tops, soft sweaters, warm coats and versatile shoes, my winter capsule wardrobe has plenty of layering options to cater for the warm inside, and the freezing cold outside, wind and snow. Most of the colours I have chosen for this capsule wardrobe are neutrals – white, beige, grey and black. I tend to make a majority of my wardrobe neutrals for two reasons. Firstly (and most importantly) because I really like wearing neutrals, and secondly because it makes mixing and matching different pieces so much easier. It’s also great to choose your staples in neutral colours so that they are more timeless and so you will get more wear out of them. I’ve chosen one accent colour for my winter capsule wardrobe and yes you guessed it – it is blush. I’ve weaved the blush accent through with some basic pieces and a just couple of feature pieces. Want to see how I packed this capsule for a carry-on only trip? Take a peek over here! Highlights of our First Year living in Switzerland + a Giveaway! Great capsule! I love the pink accents, and how thoughtfully you’ve broken down each category! How do you create those visual layouts? It would be great to have one image of my whole winter capsule all in one place! Hi Ellen, yes these layouts are very handy to keep track of your capsule! I create them using Adobe Illustrator but if you aren’t familiar with the software you could also try something like Canva (https://www.canva.com/templates/collages/fashion/) or the Polyvore Collage App is really easy to use too! (https://www.polyvore.com/cgi/app). Hopefully that is helpful!